Feathers is a children’s picture book written by Phil Cummings, illustrated by Phil Lesnie and published by Scholastic Australia (2017.) RRP: $Au 24.99 HB. I have previously reviewed Cummings' Night Watch and Bridie's Boots and Lesnie's A Soldier, a Dog and a Boy and Once a Shepherd. What a lovely concept this is for a children’s picture book! Cummings has used vivid, poetic language to show us the flight of a sandpiper to its breeding grounds. We see the sandpiper fly “through whirlwinds of tumbling leaves that fluttered like butterflies”. We watch as some of its feathers fall, and are caught by children living in very difficult environments. We see Mia, who catches the final feather, and agree with her that she is lucky not just to catch a feather but to live in a peaceful, un-ravaged place. Lesnie’s illustrations are detailed. They reveal the contrast between the delicacy of the sandpiper’s feathers and the harsh terrain through which the bird travels. I love the way Lesnie helps us get a bird’s eye view of what’s beneath, the beautiful colours and textures that bring land and seascapes to life for us, and the soft golden light that shines from his illustrations. Feathers makes a wise book choice for every library and home! It would make a wonderful picture book for students to compare and contrast with Jeannie Baker’s Circle, a picture book that shows us the migration journey of the Bar-tailed Godwit. 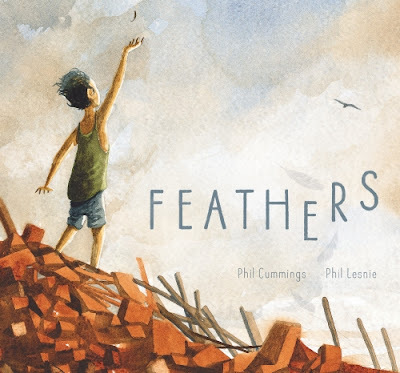 I’ll be adding Feathers to my list of children’s picture books about Change, and my list of children’s picture books about Environment.